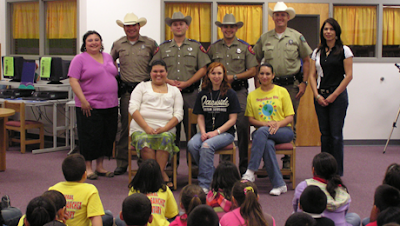 Career Cluster Day was a half-day event that was organized by the second grade teachers from General Ricardo Sanchez Elementary. This event provided their second grade students the opportunity to explore various careers by meeting several local officers. Career Cluster Day differs from a traditional Career Fair by offering information through a single grade level. Through small group presentations, more student-presenter interaction was made possible. Presenters discussed the skills they regularly used (on the job) and also provided examples of their typical work day through video presentations. Pictured above are local officers, General Ricardo Sanchez Elementary second grade teachers, and students (Submitted by A.B. Villarreal).